We have added a new product into our portfolio: Soudal Metal Fix. Soudal Metal Fix is part of Soudal’s new “Fix” range which includes Soudal Pool Fix, Soudal Zinc Fix, and Soudal Green Fix. Soudal Metal Fix is a sealant/adhesive based on Soudal’s SMX Hybrid Polymer technology, so it’s something like Fix All. Just like Fix All, it has very high adhesive strength, suitability on a wide range of materials, and can be used in many, many difficult conditions and scenarios. For example, it can work underwater. Metal Fix is targeted at the sealing and bonding of metals such as steel, aluminium, and iron. It’s a great adhesive to use on things like metal fixtures, metal stairs and structures, steel works etc. It can also be used as a sealant, especially for when one substrate is a metal, due to its appearance – think stainless steel counters. The key feature of Metal Fix is in its appearance. It has a metallic silver colour, and perfectly matches most metallic substrates. 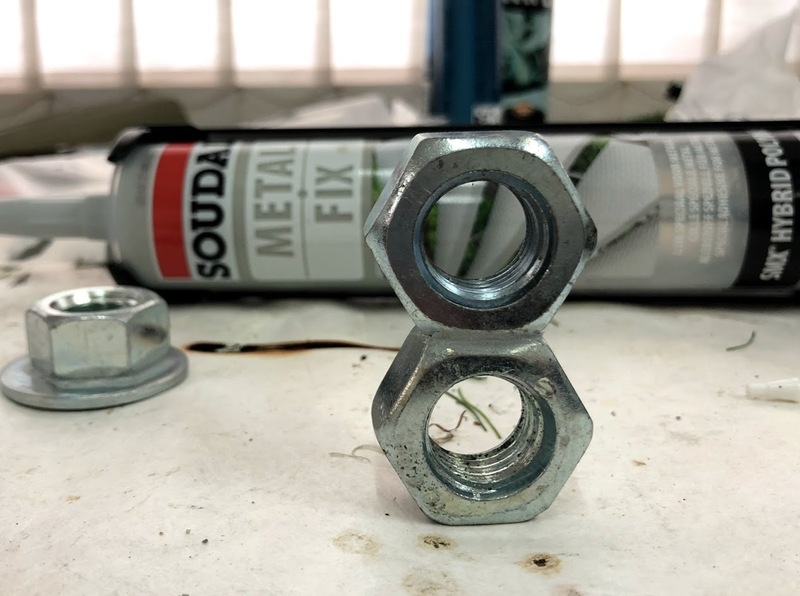 Soudal Metal Fix used to adhere two nuts together, creating an invisible bond. The rest of the features are, at this point, almost a norm, given how successful we have been with the Soudal Fix All range. The main differentiating factor between the Fix All range and this product is the colour. More information available at the Soudal Metal Fix page. What is this “- Fix” range? Unlike the Fix All range which markets that one product can do many jobs, this “- Fix” range is the exact opposite – it is tailored to very specific applications. They are all based on the same hybrid polymer technology as Fix All. In addition, this range is packaged in transparent cartridges that showcases the colour of the product. In all honesty, we’d much prefer if Metal Fix was marketed as “Soudal Fix All Metal” instead. We decided only to bring in Metal Fix from the range because the other products are too similar to our Fix All products. In most cases, you can use the equivalent Fix All product to similar effect. Joking aside, we do not have regular requests for sealants in green. We do satisfy some requests on an indent basis, so contact us if you need a green sealant / adhesive. Why did you introduce this item? Who is it for? However, we do regularly have requests for metallic silver (sometimes called aluminium colour) sealants and adhesives. Also, we have many customers in the metalworking and steel industries, so this product will be perfect for them. Cheap. Buy it here if you need one piece, or get in touch with us if you need it in your factory.